Ossi started photographing nature just a few years ago, when he was 18, but quickly caught the bug when, as he says, “I realised that I could record the moments I cherish in nature." Relishing the feelings of relaxation he enjoys when outside, and driven to continuously improve his photography in order to showcase the best of nature, Ossi has devoted many hours pursuing his passion. His favorite shot to date is a photo he took on the first day that he photographed foxes, when chance and patience combined to produce an adorable image with an impressively symmetrical composition. He says: "I was driving through countryside and had planned to photograph some flowers in the early morning. But the flowers were closed after a cold night, so I decided to drive back home. On the way, I saw some small creatures crossing the road. I wasn't sure what they were, so I parked my car and stepped out carefully, and saw the little creatures go under an old shed. I lay down a few metres away and waited to see what would happen. 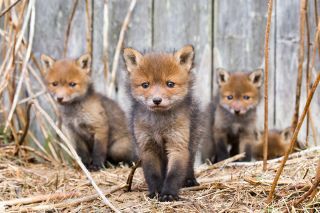 “After some time, these tiny fox cubs came out. They weren't really afraid of me and they played around by the shed. I took maybe 200-300 photos there, and my favourite one is where there are four fox cubs in the same photo and they're kind of walking towards the camera. I think nature photography has made me patient – you have to be to get the shot." The pictures were taken with his Canon EOS 6D with a 100-400mm f/4.5-5.6L zoom. Ossi has gone on to photograph many more foxes and fox cubs all over his city, including in his back garden. As he points out, you can find wildlife and nature in "All kinds of places – even bushes and shrubs will have animals gathering around. Even in the smallest parks, you can find wildlife."